Bell pepper or capsicum is a vegetable that is bell shaped and plump, and available in various colors like green, yellow, red, purple and orange. It is rich in vitamins and minerals and helps you to maintain a healthy body devoid of any disease. By consuming bell peppers daily, your skin is kept young and healthy because of the antioxidants and phytochemicals present in it. Vitamin C is found in abundance in red, green and yellow bell peppers. This helps in the formation of collagen, which helps you to get a firm skin and protects the cells from getting damaged. The skin gets the power to fight against oxidative damage. 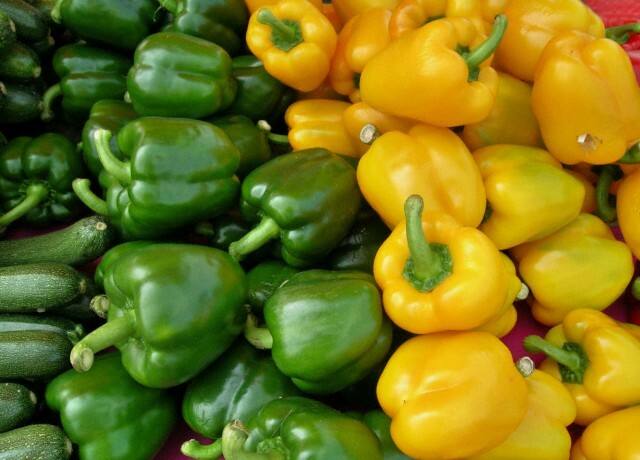 Bell peppers have great anti-fungal and anti-bacterial properties, which helps in the healing of shingles and athlete’s foot when taken with other medications. Mixing bell pepper and carrot juice and taking it daily can clear all the blemishes and rashes from your skin and make your skin smooth and glowing. The high antioxidant content in bell pepper juice helps in reversing the sins of ageing. So consuming small amounts of pepper juice daily helps you to stay young and beautiful. Antioxidants fight against the free radicals that cause damage to the cells. Although all bell peppers are good for your health, red ones have the highest nutritional values. So, consuming bell peppers daily is essential for a healthy life. Red bell pepper is a good hair growth stimulator and promoted hair growth by increasing blood flow in the scalp. This helps to prevent hair loss and aids in the proper growth of hair, and also protects the follicles from DHT (dehydro testosterone). By applying bell pepper on your hair blood circulation is increases and therefore the growth of hair is also enhanced. Boil a few dried red bell peppers in water and cool it, then apply on the scalp with cotton. Leave for about 15 minutes and then wash hair. If you do it twice in a week, it increases your hair growth and keeps your hair healthy. Bell pepper is a rich source of Vitamin C, which is very important for a healthy hair. It helps in the absorption of iron and ensures that RBC has enough iron to carry o the hair follicles. Vitamin C is also needed for the collagen formation and collagen is essential for hair follicles, blood vessels and the skin. A deficiency of Vitamin C in your body leads to the formation of dry and splitting hair that breaks off easily. Green bell pepper is rich in natural silicon and this is very beneficial for healthy hair and nails. Capsicum is rich in antioxidants and anti-inflammatory products, which lowers the risk of cancer. It also contains sulphur compounds, which is good for health. The enzymes present in capsicum prevent esophageal cancer and gastric cancer, and the carotenoid lycopene lowers the risk of prostrate, cervix, bladder and pancreas cancer. Unlike other peppers where capsaicin, which is responsible for the hotness of the peppers, is found in large quantities, bell peppers contain it in very small quantities. So unlike other peppers, they help in activating thermogenic reaction mildly and also increase the metabolism, keeping the heart rate and blood pressure normal. This allows you to lose your weight. Capsaicin found in the bell pepper lowers the levels of cholesterol and triglycerides in the body. The ulcer causing bacteria is attacked by capsaicin and it also increases the immunity of the body. 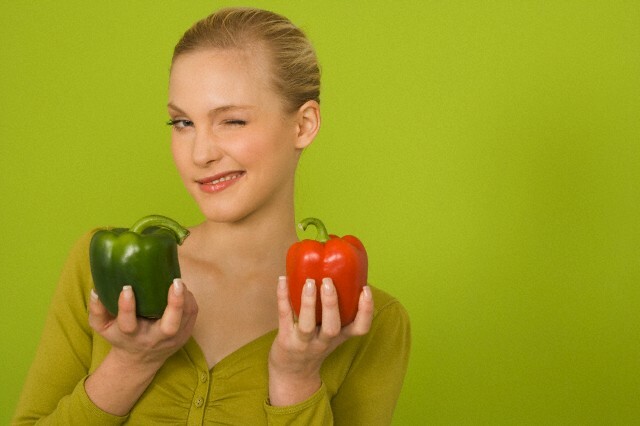 Mucus membranes that get congested in the nose and lungs is cleared by bell peppers. It also throws out the toxins from your body through seating. So, daily intake of bell peppers keeps your body free from toxins. Vitamin C is essential for the absorption of iron in the body and red bell pepper provides about 300% Vitamin C that is needed daily. So if you have iron deficiency, consuming red bell pepper is good to cure it. Consuming red bell peppers is good for a healthy heart as it contains lycopene and green bell peppers contain fibers that lower cholesterol. Vitamin B6 and folate present in bell peppers lowers the level of homocysteine, which is responsible for many heart diseases. In addition, the antioxidants Vitamin A and C help in contradicting the fee radials. Potassium is beneficial in lowering the blood pressure. Bell pepper is rich in Vitamin C, which is needed for immunity and to have collagen. It lowers the risk of arthritis and other joint pains. Vitamin K is needed for clotting of blood and also for healthy bones. Vitamin B6 and Magnesium found in capsicum lowers the anxiety levels in people, especially that is found during pre-menstrual periods. The juice of bell peppers is beneficial in treating various gastrointestinal problems like diarrhea, ulcers and dyspepsia. Various respiratory problems like asthma, emphysema and lung infections are also lowered by consuming its juice, besides treating sore throats and bleeding nose. I must tell you how beneficial this site has been for me. Thank you so much!! Some of this I knew , but have learned soooooh muh more. Thank you again. WHERE CAN I FIND DRIED BELL PEPPER?